Born on the 14th March, 1862 in Oslo (Christiania), Vilhelm Frimann Koren Bjerknes was destined for a career in science. He obtained a Master’s degree in mathematics and physics in Kristiania 1888 and continued his studies in Paris and Bonn, where his work together with Heinrich Hertz on electrical resonance resulted in a doctoral thesis in 1892. 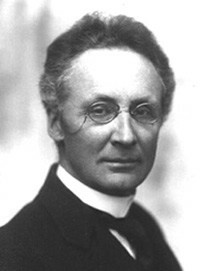 While he was professor at the University of Stockholm (1895-1906), Vilhelm Bjerknes worked out a synthesis of hydrodynamics and thermodynamics, which was applicable to large-scale circulation in the atmosphere and the oceans. Based on his theorems, he published a programatic paper in 1904 on “The problem of weather forecasting as a problem in mechanics and physics” (Meteorologische Zeitschrift, Wien 21:1-7) where he postulated the procedure now know as numerical weather forecasting. Once at the Geophysical Institute in Bergen (1917-1926), he laid the foundations of the Bergen School of Meteorology. Bjerknes established a network of weather observations in Norway that collected data that would be of great importance in their later work. Together with his son Jacob, also an acknowledged meteorologist, he put forward the acclaimed “polar front theory”. In analogy with WWI battlefronts, the meteorological “fronts” form the boundaries between cold and warm air masses and their theories and models suggested that weather activity is concentrated in these relatively narrow zones, where mid-latitude cyclones were proposed to form, live, and decay. Today, practically all weather forecasting is based on Bjerknes principles described in his paper of 1904 and made possible thanks to the enormous computer capabilities of today. The work by Bjerknes marked a turning point in atmospheric science and remains remarkably unaltered to this day. Further, Vilhelm and Jacob Bjerknes conducted several studies of the ocean circulation, air-sea exchange, and climate variability that laid the basis for modern research on climate change and the role of the ocean in the climate system. Jacob Bjerknes carried out pioneer studies on the North Atlantic Oscillation (NAO), by describing its major features and how it influences the currents and temperature conditions in the North Atlantic. Nowadays the vision provided by the Bjerknes family has been taken further by simulating climate variability in models that couple the atmosphere, land, and oceans, in an attempt to estimate the response of the climate system to driving forces. The Bjerknes Centre is thus named as a tribute to their efforts. Vilhelm Bjerknes (1862-1951) was a central figure in the pioneering stage of modern meteorology and oceanography, and was the leading figure of the “Bergen School” of the physics of atmosphere and ocean.